With almost three years of occupational therapy experience under my belt, I have a diverse set of clinical skills. I have sought out additional certifications, leadership opportunities, and experiences apart from the norm. OT inspires me and makes me realize genuine progress can come from hard work and kindness. I would rather no other profession than the one I have chosen. However, the realities of service delivery admittedly hit me hard after graduation. That's when I started looking at alternative occupational therapy jobs. Healthcare overall is a difficult paradigm to adjust to. OT school provides you with all the encouragement and tools you think you will ever need, and it lights the fire within most therapists to enter the working world and make the changes they wish to see. Sadly, this fire may dim for some once entering a typical clinical job, as the image of OT in the working world is different than that portrayed in school. Productivity standards are rigorous and ever-increasing, opportunities for career development may be few and far in between, insurance forces your focus to be on quantity of therapy provided rather than quality of interactions, and facility restrictions may limit the type of therapy you implement. Sometimes these restrictions even limit the breadth of a creative and adaptive OT’s mind. If you are currently having some of these same thoughts, I ask you to please not feel discouraged. There are many non-clinical roles which use an OT’s expertise, but in different ways. These are good options if you are looking to avoid the pressures of standard clinical work while still having an impactful role in the OT world. Additionally, there are several non-traditional methods of clinical work to enter into which can similarly alleviate the stresses of a full-time nine to five gig. So what are some of these alternative occupational therapy roles? Contract therapy, teletherapy, and utilization review are ways to leverage your OT degree in unconventional ways. Of course, this is by no means an all-inclusive list, with many more roles developing each day. Furthermore, many of these jobs can serve as a springboard into non-clinical career paths. So if a return to standard patient care is not in the cards for you, there is a stable future in any of these roles. This is something I considered for several years before finally deciding it’d be a good option for me. Contract work, what some call travel therapy, is an especially good way to keep a hand in clinical work. Therapists are able to gain experience in a variety of settings, and not get caught up in larger systems issues related to a facility. With contracts typically lasting a minimum of 13 weeks, this is a good way to maintain focus on the immediate day-to-day duties related to your job. Job seekers can typically find positions in each practice area, perhaps along with some contracts for unique roles such as program development for a new OT department. It is also a great way to see new geographical areas, as you are able to take contracts local to your desired area or pick a different state for each placement you take. If you need any other perks aside from cross-country travel, companies also offer incentives such as free continuing education, fully furnished company housing or a housing stipend to find your own accommodations, a stipend for meals and incidentals, health insurance with vision and dental, and 401k programs. Cumulatively, this makes contract work one of the most lucrative areas for therapists. There are expected cons — some practitioners caution against contract work as a new graduate due the roles being largely independent. However, if you excel at fieldwork sites and prove the ability to work independently shortly after starting a position, you may see this as a positive of contract work. Aside from a supportive travel company, there is often little clinical support at facilities where you are contracted, since most roles expect therapists to hit the ground running. Contract therapists also warn doing contract work for extended periods of time gives little social support, making it important to find such networks yourself. However, this can be somewhat avoided by taking contracts in cities where you have friends or family and forming a network from there. It is important to do your research to find a travel company that is a good fit, as each offer slightly different benefits and programs. It often comes down to the connection you make with the recruiter and the agency itself, rather than the pay packages. That aspect alone usually makes you confident enough to take on any contract you are offered. As an emerging niche, telehealth is on the cutting edge of healthcare, with expansion now including therapies. Being this is so new, many therapists don’t even know this is a readily available opportunity. As a result, this is a chance a lot of other therapists often won’t take, possibly due to fear of the unknown or lack of knowledge. With as little as a reliable internet connection and webcam, you are able to see clients. 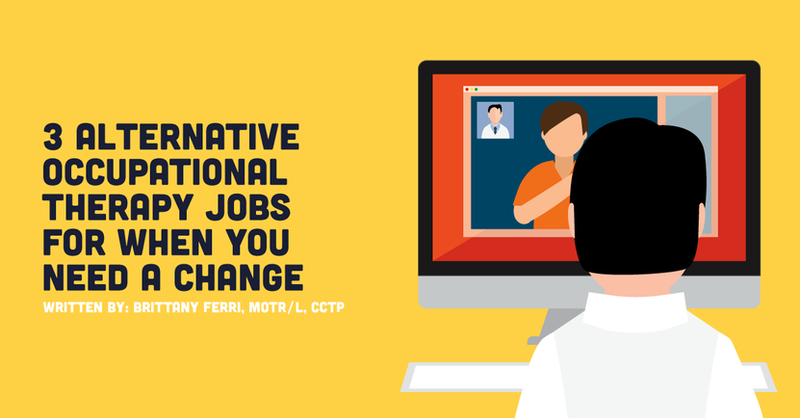 Most teletherapy companies prefer therapists with school-based OT work experience; however, they are open to accepting therapists without it. Most companies look for therapists who are willing to do after school sessions and have some availability for the occasional weekend patient. If you’re wondering how therapists can treat entirely virtually, teletherapy companies have programs with access to games, activities, instructions, writing guides, and more. This is an especially good way to flex your creative muscles by stepping out of your comfort zone. If you can’t imagine therapy any way other than sitting on a stool treating a patient on a plinth, this is a good way to experience something entirely different. As with contract therapy, it all comes down to finding a company that makes you comfortable enough to do your best work. Benefits vary slightly from place to place, but adequate research of companies only proves advantageous. This is a role growing in popularity, as many insurance companies strive to achieve a better method of managing claims for reimbursement. In turn, large and small insurance companies are seeking to hire utilization management clinicians or utilization reviewers. These roles are filled by physical therapists, occupational therapists, and registered nurses who complete reviews of clinical documentation from members of their insurance companies. Such clinicians use their on-the-job expertise to determine whether therapy services should continue or even begin. This job is quite different from most other jobs therapists hold - it involves sitting in an office for much of the day with little to no patient interaction. However, this role still involves frequent collaboration with fellow clinicians, use of clinical judgment and skills, and knowledge of how therapy is carried out, both in the clinic and in terms of regulations and standards. There is a large opportunity to make a big difference by assuming a role such as this, as you can be part of a group of practitioners who ensure therapy is used in the most appropriate and necessary means as possible. Guaranteeing proper use of therapy services helps make therapy available to all those who need it most. With paid holidays off, continuing education reimbursement, and a salary comparable to that of practicing therapists, this role brings more perks than some clinical jobs and can provide a new range of experiences to therapists looking for additional responsibilities. My advice to those of you reading this and thinking of venturing away from your own clinical job is this: if you feel your passion and skills would be better used in another area of OT, go for it. This is even the case if you are thinking of changing practice settings but remaining in clinical work. But do your homework, and know where to channel your energy based on your interests. It is even possible to get involved in non-clinical duties at your current role before deciding if that route is for you. I firmly believe these are areas where OTs can make a large impact. If you are struggling to acclimate to new settings or are considering but have yet to make the leap to non-clinical work, don’t hesitate to reach out for mentoring! I would be happy to lend advice to anyone going through a similar experience — just reach out to me! Do you have any other non-clinical areas you’d like to share? Let us know in the comments!